STOP HS2 | HS2 is Amber Red, yet again. 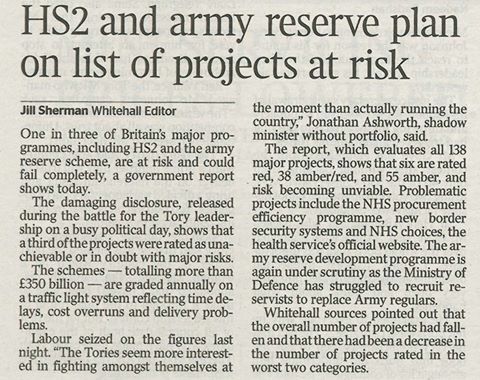 The Infrastructure and Projects Authority (formerly the Major Projects Authority) published it’s annual report yesterday, and it will come as no surprise to those of us living with HS2 for the last six years, that HS2 has been rated as ‘amber-red’ yet again. “Successful delivery of the project is in doubt, with major risks or issues apparent in a number of key areas. Urgent action is needed to ensure these are addressed, and whether resolution is feasible”. HS2 was first judged to be ‘amber-red’ in November 2011, and has now been classified as such in every single MPA/IPA annual report. As we always point out when hearing this recurring news, this hardly suggests that the “Urgent action” which is needed has ever been taken. 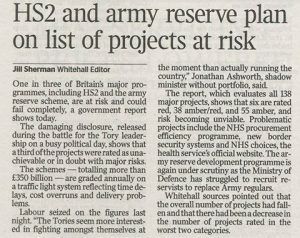 Normally this report, which has rated 44 of all the 138 Government projects as either ‘red’ or ‘amber-red’ gets a bit more news coverage, but being released the day after Chilcot reported, and the day that the Tory leadership contest came down to two, along with there already being a significant HS2 story, has resulted in a near news blackout of the story, with only The Times covering it as far as we can see. On Monday, the Public Accounts Committee will be conducting a hearing on HS2 at 4pm, following the recent National Audit Office report. You will be able to watch it here. So no one is in charge of total economic budget breaches across Europe and UK. UK needs to prioritise local requirements and curtail HS2.